The Swiss Academies Award for Transdisciplinary Research (td-award) is given biannually in recognition of outstanding transdisciplinary work according to the criteria developed and published by td-net. Projects carried out by individuals or research teams are eligible. The winner or the winning team receives 75,000 Swiss Francs. 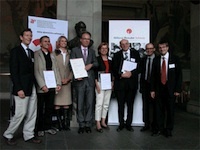 Awarded by Stiftung Mercator Schweiz, this is the highest reearch prize of the Swiss Academies of Arts and Sciences. The td-award 2010 has just ben allocated at the td-conference 2010 to the project “eDiversity: The Legal Protection of Cultural Diversity in a Digital Networked Environment.” This project was directed by Prof. Dr. Christoph Beat Graber of i-call, the research center for international communications and art law at the University of Lucerne. It was an integral part of the first phase (2005–2009) of the NCCR Trade Regulations. The project was selected as the winner for its integrative, timely, and path-breaking intervention in the field of media regulation concerning the protection and promotion of diversity of old indigenous as well as very new cultural expressions. td-net also honoured the life-long engagement in transdisciplinarity of Prof. em. Dr. Thomas Bearth from the University of Zurich, above all his commitment to the international initiative Lagsus (Language, Gender, Sustainability), which was carried out in often adverse political circumstances in Indonesia, the Ivory Cost, Uganda, and Namibia.